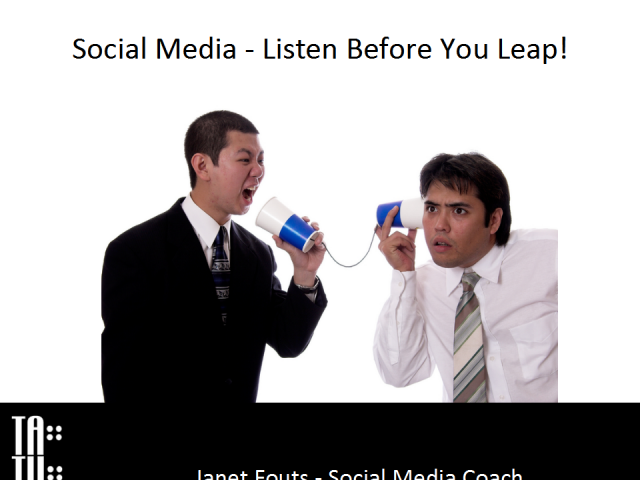 Social Media -Listen Before You Leap! Before you dive into social media for any reason, listening should be your first step. What are people talking about and where are they doing it? Is there buzz out there about you or your product that you didn't know about? Who should you be connecting to? Has there been a recent event you want to find out more about? Setting up listening tools from free to paid versions can give you a tremendous amount of information and help you find even more things to talk about. I'll give working examples of listening tools, outline a strategy for effective listening and give you some ideas to use this information in a real world setting. Learn the techniques you need to adopt social media into your business from the author of Social Media Success! Title: Social Media -Listen Before You Leap!